Awesome! I'll order one as soon as they're back in stock and start playing around. In the meantime, here's some homework for you. ;-) Figure out the code for the intercooler pump. I assume it's on the CAN bus because you can turn it on and off using STAR. 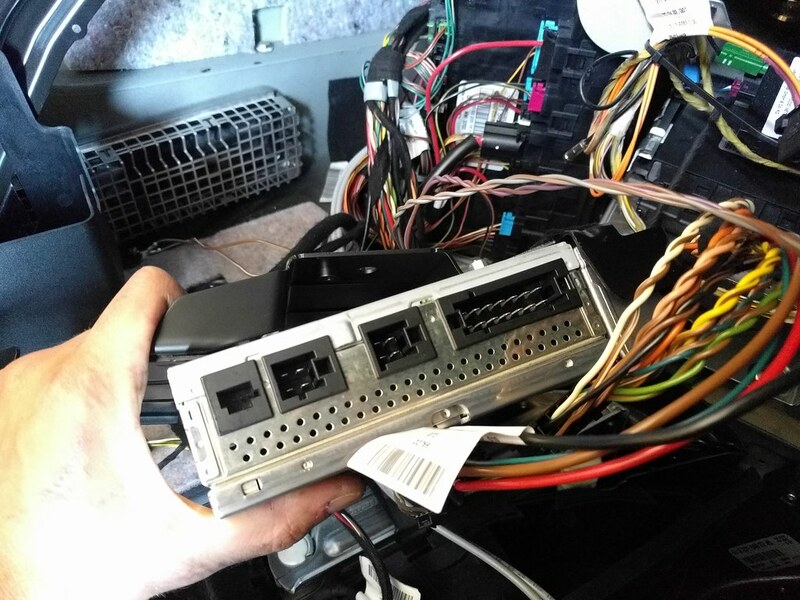 It would be way cool if we could turn that thing on using a button inside the car without having to cut up the factory harness in any way. I am not going to be doing that, but it's almost definitely doable with CBT if it is doable with Star. Currently I only have my CBT wired into CANBUS B (interior), to tinker with the pump you would also have to wire it into CANBUS C (chassis/motor). CBT actually supports three buses at the same time, so this is very doable. A project for the future, for sure. The steering wheel is off. Nobody makes hub adapters to I will have to do the FCP Euro Motorsports team did with their C300: hack off the rest of the steering wheel and use the aluminum center as a foundation to build my own spacer. The bottom right corner there is (i am guessing) how the car keeps track of the steering angle, be it for ESP or what have you. In terms of the shifter buttons, these are interesting. Each button has only two contacts (expected), but the complete mini harness for both buttons has only two terminals as well. 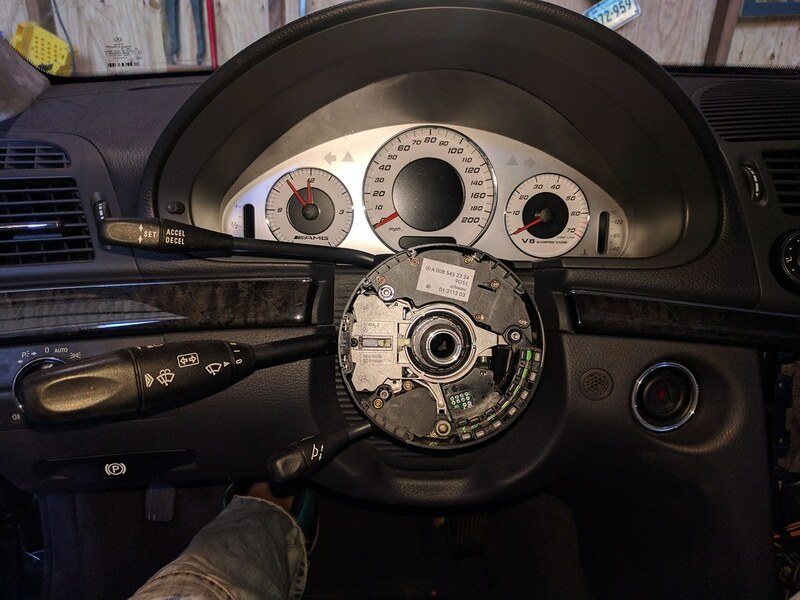 This wouldn't be so weird because the steering wheel buttons on the front send the data via CANBUS B, however, this is a separate circuit entirely. The plan now is to try and use factory shift buttons on a Momo Prototipo (already ordered) along with the factory mini-harness. The original plan was to use custom momentary switches on an RJ9-coil cord bypassing the steering column. it takes apart nicely and will be widened and modified to accommodate two Wilwood reservoirs, so we can preserve the factory ESP/ABS function instead of the usual drifter T-junction for rear brake lines. That and the rear brakes are massive. We will need the hydraulic volume displacement of a dual setup to do it efficiently. Took the stupid look-at-me badges off. 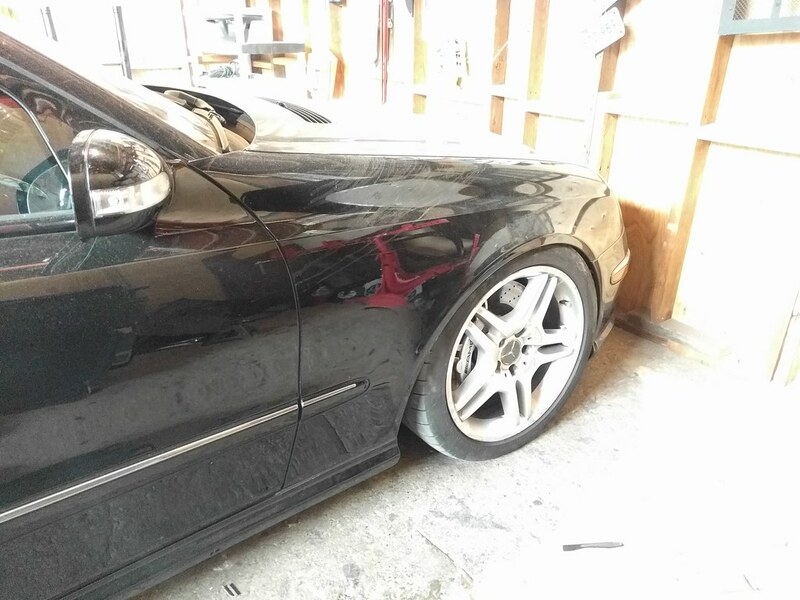 Nothing like some extra plastic to make a $70K sedan look like a Chinese toy. Can someone help me out figure out what the pump next the audio amplifier is used for? Behind the trunk trim on the left is the said pump and on the opposite side (on the right) is a large shiny air tank. 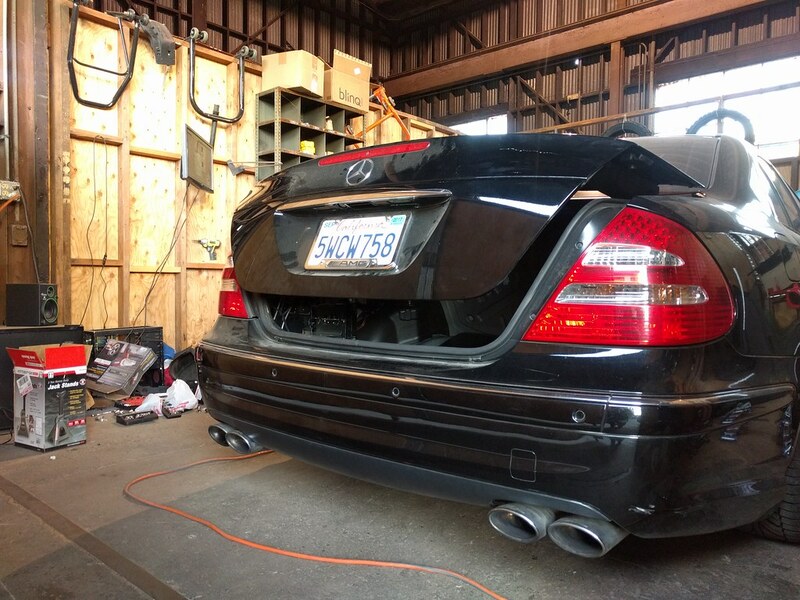 The suspension pump is front left, behind the bumper and since the doors in this generation Mercedes aren't pneumatically actuated, I'm at a bit of a loss. I don't remember seeing a pump on the left side of my trunk. Got any pictures? Pretty sure the silver air tank on the right side is for the airmatic system. I reviewed the original thread and I looked at eBay listings and I see that my connections don't match the ones found on other W211s. Look at my photo of the back of the headunit again, the only hookup is the three power leads (ground, ACC, VDC) and two fibreoptics IOs. 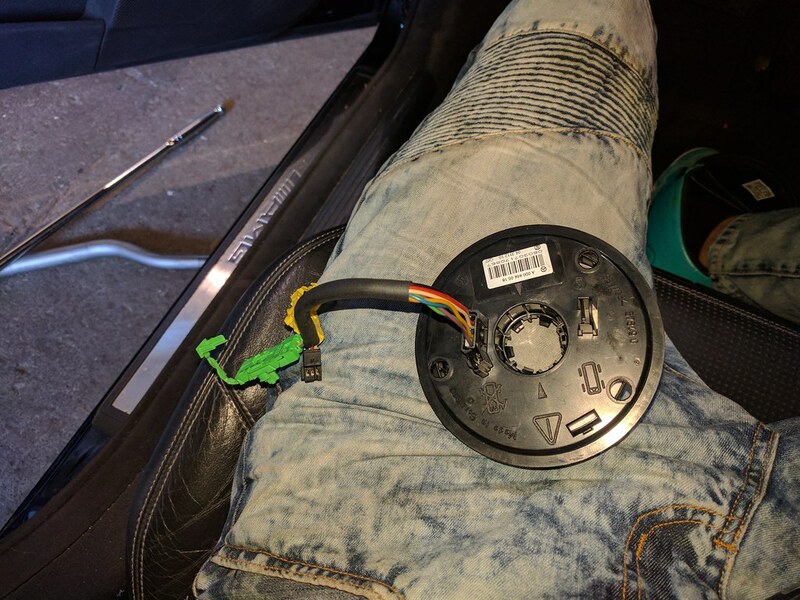 Am I correct that I will still be able to install this unit, but I will need the 6m cable running to the back of the car where the connectors will be available near the factory amp? Last edited by jumph4x; 05-11-2017 at 02:05 AM. Setup my Arduino development environment here, after struggling with the custom hardware package on Ubuntu, it worked right away on Windows. I guess this will be the one software project I work on in Windows 10. There really is a first time for everything! It compiles and everything is happy, but the stock program is already using 72% of the program memory. Considering I don't have concrete plans for it yet, this will probably be plenty of room for whatever I end up doing. This is build 0.7.1, which the official desktop app doesn't even know about yet (it hasn't been re-released since the latest pull request got merged for the Arduino code). That pump runs all the air bladders in your seats. You only need 6m cable if you plan on using the factory amp. 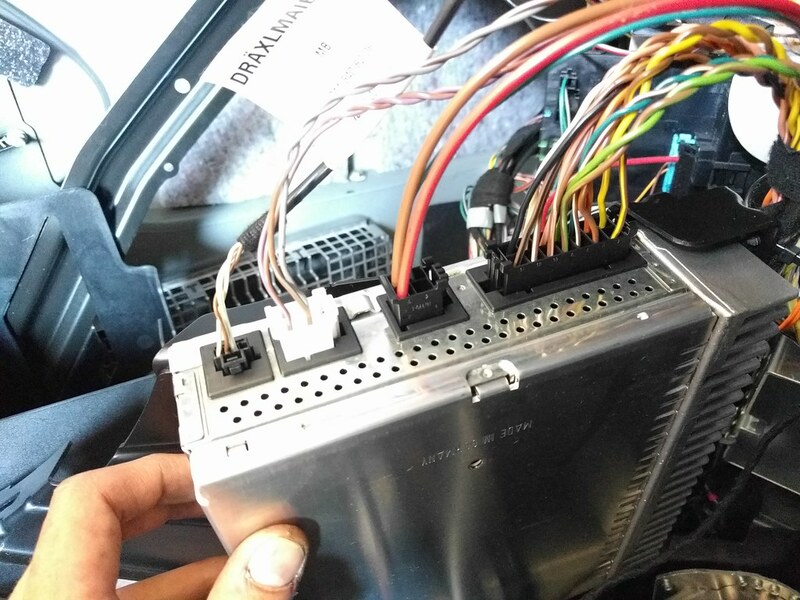 You would need to just ditch the wiring on the back of the head unit... its worthless, just zip tie it up out of the way. You need the usual, 12v constant, 12v switched off ciggy, ground. Rest is pretty easy. 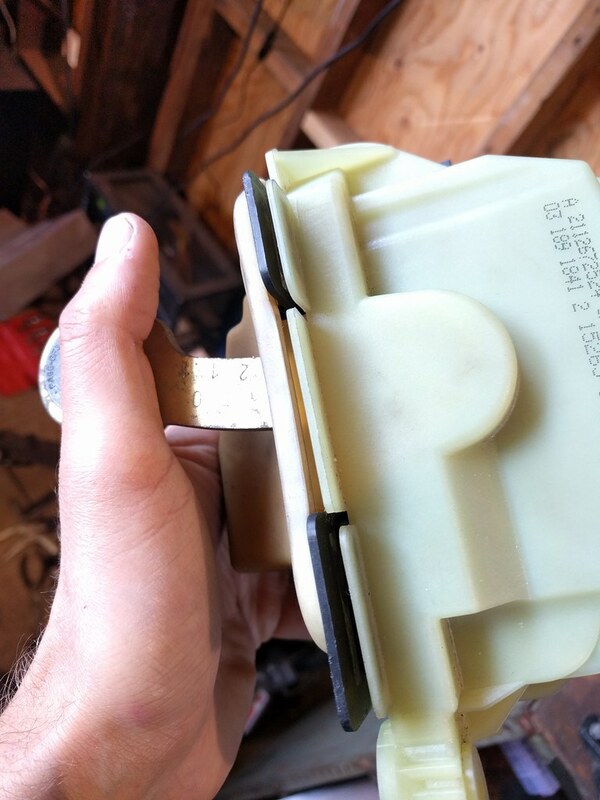 There is a plug that connects to the speaker connector and has pig tail to go to your aftermarket amp speaker out. If you use the factory amp get the 6m cable and the factory Fiber Connection box from what I read. I had gear to install so I said screw that and went another way. I suggest you get a used 300/4 or something along the lines of 75w rms/ch. I can only turn the gain about 1/3 of the way up on the amp and then the speakers get to their limit. You will need a small amp to power the factory sub if you want a little knock 150rms is all if could take in my opinion. I just took a piece of silicone vacuum tubing to connect the fiber circuit off the back of the HU. 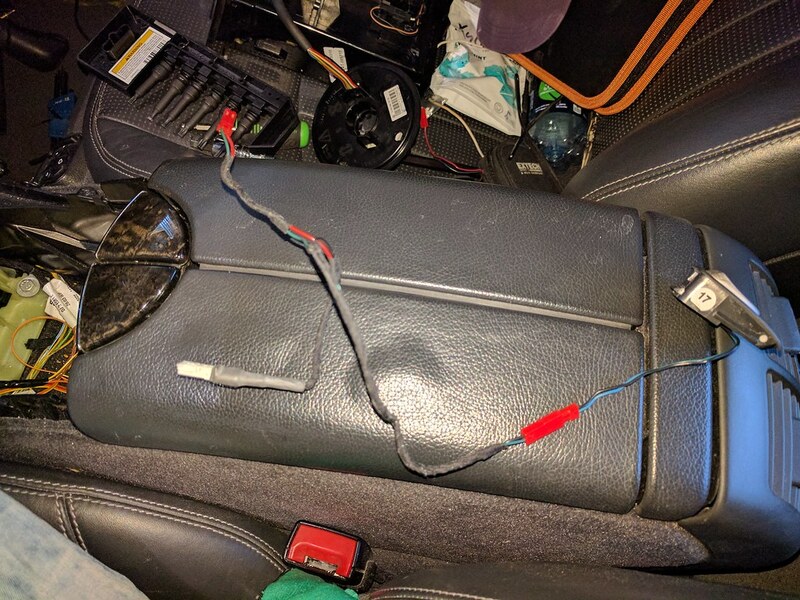 I could not get anything off the connection on the back of my head unit in ways of power,ground and 12v switched. Last edited by BoostedAero; 05-11-2017 at 08:42 AM. It looks like CANBust Triple is a zombie product. The store is empty and all of the forum posts have gone unanswered for over a year. I'm looking at Carloop.io as an alternative. Do you have any experience with that product? Nope. Looks perfectly fine though. Last edited by jumph4x; 05-11-2017 at 03:47 PM. Makes sense. I want that 6m cable so that I can place an aftermarket amp where the factory one was. No way am I using the factory unit. We'll find out 'cause I just ordered one. Thanks! Looks like I should put it back where I found it. Got the center console out, got the gear selector out. Pics soon. The Keyless-Go button will be easy to rewire, the wires and connector are easy to access. Same for the linkage to detect gear changes at the shifter post. I don't think I will need to tap into these, but if anyone does - it's pretty straight forward. 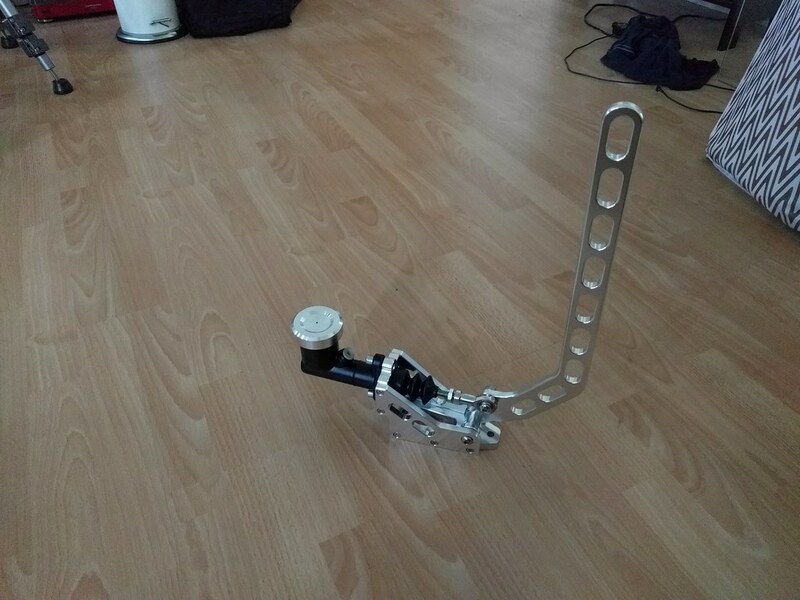 Shifter will stay off while I cut the carpet and plan some plumbing routing. Looks like I have the HK setup with a million speakers in this car, took some photos for eBay vendors to make sure I'm buying the right stuff for this car. The folklore and hilarity of the factory amp placement did not disappoint. I was laughing while desperately trying to under the last bolt, it's pretty extreme. 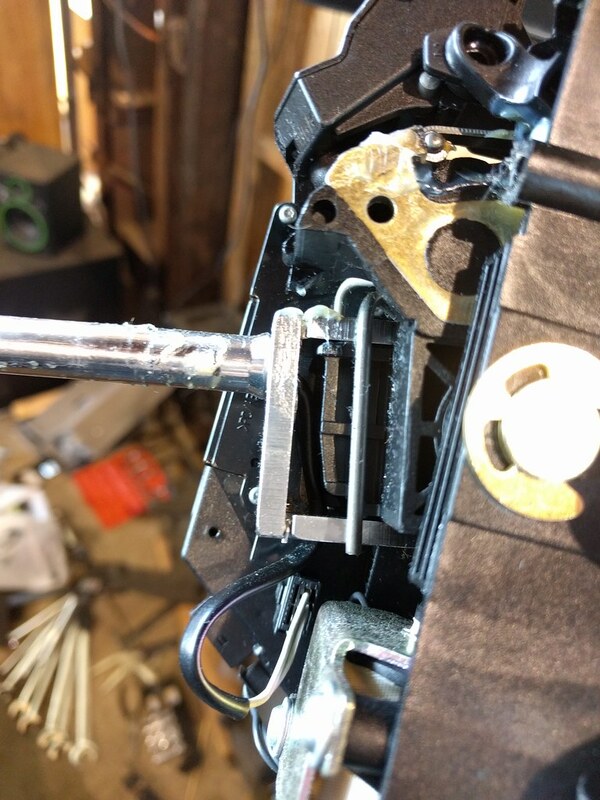 When getting the shifter assembly out, there will be mechanical linkage at the bottom of it with a circlip holding it together. 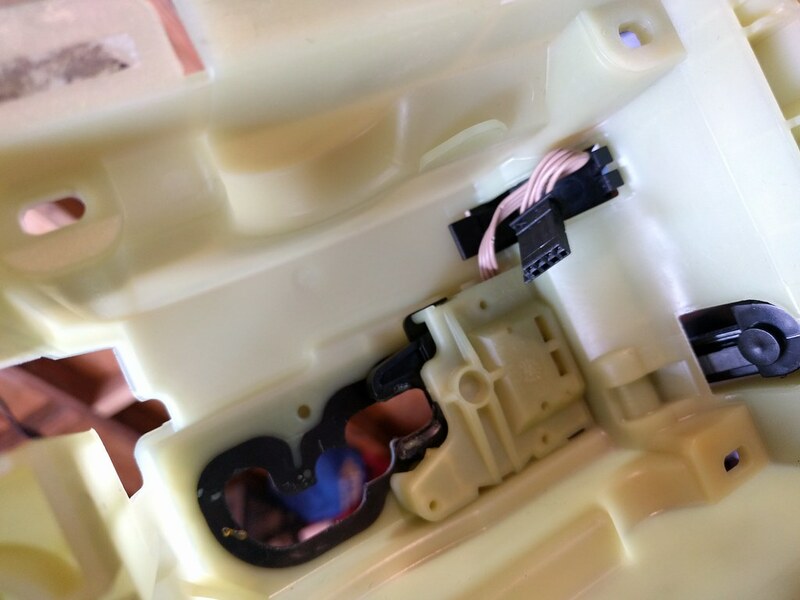 When the entire unit is out, note that the black and white plastic assembly pieces are glued together. 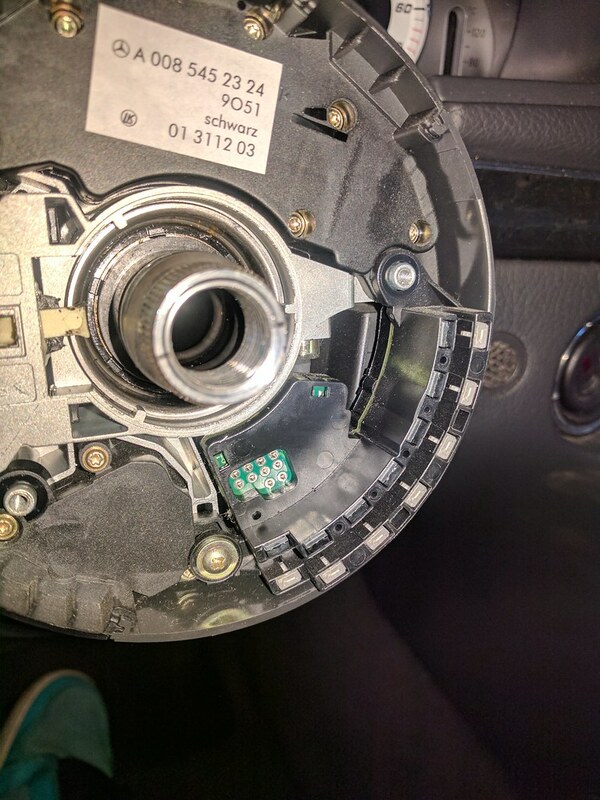 Secured to the top of the white cover is the tip-sensor for changing gears. If you didn't have factory buttons but wanted to retrofit, what I would recommend is tapping into these guys, running a wire to the steering wheel dash and then making a race-style RJ9 coil cord to the wheel. Would look awkward on the factory wheels, but I bet it would look great with an aftermarket wheel. The assembly will stay out while I jack the car back up and start measuring and planning plumbing of brake line. So, since I have the Harman Kardon speakers, I would like to keep the subwoofer and the two rear parcel speakers. Last edited by jumph4x; 05-16-2017 at 04:50 AM. Ordered the Android headunit and a 4 channel Pioneer amp for the trunk. Cheers. I do have the power trunk, mind linking me to a thread or posting a photo of where and what to look for? Everything I could see without close examination looked good. Which head unit did you end up going with?